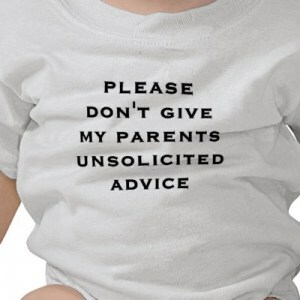 New parents will always receive advice…from many different people! Don’t be too quick to judge, there are many “pearls of parenting” that you just might learn! Parent with an open mind to advice, but make your own parenting decisions. I am slowly learning how to be a parent of adult (adult? really?) children. It is not an easy transition, let me tell you! After all, I DO know what is best for my kids (at least I think I do)! I do have life experience and a little bit of wisdom at my age. When the time comes that we are blessed with grandchildren, I am sure that I will have to be careful as I know that I will want to give tidbits of unsolicited parenting wisdom. I am beginning to realize how difficult it is to step back as a parent and allow adult children to live their lives without my guidance. Once again, my respect and appreciation for my own parents has grown…you never know what it is like to be a parent until you are in the middle of it, and that includes being a parent of an adult child! Well here you are; a new parent. Everyone wants to offer advice to a new parent. You get advice from medical professionals, friends, neighbors, parents, sisters, brothers, and even strangers in the mall. I can remember a lady in the grocery check out line saying, “OOOhhhh, someone is going to have a spoiled lunch!” with a little “tsk tsk”, when my then 2-year-old daughter had a half eaten bag of vanilla wafers all over her face at 11:00 am. Hey, it had been a rough grocery shopping trip! I can remember that her comment was like nails on a chalk board to me at the time. Now as I look back, it really was no big deal…she made a true statement probably, it just made me feel like my parenting skills were being challenged. Tip number one, try to smile and then either accept advice or disregard it, but don’t let the comments of others undermine your confidence in your parenting skills. Advice from strangers is very easily disregarded; you will never see them again! The more difficult challenge is advice from friends and family…what does a new parent do? Here are a few more pearls about advice…and the biggest one is: Slow down, that advice just might be valuable. Don’t let your pride keep you from listening! Even when we disagree with our relatives and friends, it is important to remember their feelings. They give you advice because they love you and your child. When you make decisions that may be different from your parents’, this can be threatening. Parents can feel that you do not think they raised you well, or that you are critical of their parenting skills. You should always assure them that they were great parents to you, but times change, and sometimes there is totally new advice regarding child care. One example is “back to sleep”…a total change from a couple of decades ago! Knowledge is the best tool to defend your parenting choices when contradictory advice is given. New parents must be confident in their parenting choices. Look to medical professionals, trustworthy parenting books and websites, and listen to trusted mentors. The more you know, the more confident in your decisions you will be. Arm yourself with magazine articles, books etc. to support some of your parenting decisions. You can always ignore advice from friends and relatives, but you don’t have to be confrontational about it. “Thanks for the suggestion, that might be a good thought.” Then you can choose to ignore the suggestion if you wish. Pick your battle. Sometimes the battle is not worth it. Staying up a bit later, having more sweets than usual, watching a bit more TV, or giving in to your child’s whining occasionally will not affect the overall health or behavior of your child. Roll with it a bit! When advice is given—do not immediately get defensive. Listen first. Often you may feel like you are being criticized as a parent. Most of the time the other person is sharing something that they feel is just a valuable tip on parenting. Try to listen first—you may actually learn a parenting pearl! Understand that your parents might find it hard to accept that you are really a grown up adult who can parent. It is difficult to look at your “baby” and think of him or her as a parent! It is so easy to try to continue to parent adult children. Be sensitive, it can be hard to keep your temper in check when bombarded with advice—but your relationships, especially with family members, need to be preserved for your sake and your child’s. Agree. You might find one part of the advice that you agree with. Concentrate on that. Provide wholehearted agreement on that topic. Avoid the topic. If you have been complaining about your lack of sleep because of a fussy baby, be prepared to receive advice! Memorize a standard response and practice it. Whenever you are with a person that constantly gives you unwanted advice, have a standard response like: “This may not have worked well for you, but this is what is working best for us right now.” No anger, no sarcasm, just a simple statement. Search out like-minded friends. A support group of other moms and/or dads who think like you can bolster your confidence in your parenting skills. This is very helpful when your child is older too. Parents who you trust and who parent in a similar way to you will be a great sounding board as you try to make parenting decisions in the future. The most important thing a new parent needs is support. The last thing you want to do is burn bridges with friends or family. Not all advice will be to your liking; but listen, sift through it, and act on that which best suits you and your child. The trick is to accept advice in a loving way while making it clear that you are in charge of final decisions for your child. You are your child’s parent and advocate. You are the one that has to be happy with and is responsible for your parenting decisions. You owe it to yourself and your child to do what you believe is right for him; but to also open yourself up to the advice friends and family may offer because none of us have this parenting thing all figured out. I know my parents have certainly shared wonderful pearls of parenting…and my respect for their wisdom grows as my children do. Embrace advice given with love, don’t be threatened by it, and then be confident in your choices and your ability to parent. It is so difficult to address concerns with family members, especially your Mom! First I would remind yourself that your Mom’s heart is in the right place…2nd I would look at what criticism she is giving you…are you thinking she is criticizing you but she just doesn’t understand the reason why you are doing something. I always think it is easier when you can tell a person why you are doing something…show her the recommendations from your pediatrician or from reputable websites like http://www.Healthychildren.org…if that doesn’t work then respond, “I know you don’t agree with this, but we have decided to do this and it is working well for us.” Then don’t argue just move on. If she is disregarding instructions that are important to you or are safety issues (like car seats) then I think you need to have a heart to heart conversation telling her that these are areas that she MUST respect your issues….if they are small things like sleep schedules, or treats for older children, or TV watching….if she is not caring for your child every day, then these are battles I would not pick. Part of the fun for grandparents and children are the special things that are done only at grandma’s house! Take a step back…have a conversation when it is not heated at the moment and be sure not to burn any bridges….your child needs a relationship with grandparents!